Remember a few months back, when our regular TwoMorrows colorist (and longime DC/Marvel colorist) Tom Ziuko was battling kidney failure (due to a long string of medical incompetence, and not anything related to his genetics or lifestyle)? Well, he’s still dealing with the ramifications of such a long hospitalization and recovery period, and can still use our help. You can hear it in Tom’s own words at the HERO INITIATIVE website, where I hope you’ll make a donation to help Tom and other comics greats like him. This entry was posted in TNT on 24 October 2011 by Mr. Morrow. 2) We’ll have a limited number of pre-release copies of THE STAN LEE UNIVERSE (which doesn’t official ship till November 9). So if you’re at the con, stop by! This entry was posted in TNT on 11 October 2011 by Mr. Morrow. Our own Joe Meno, editor of BrickJournal, took time out to talk to our local news crew about his lifelong passion for things LEGO. This entry was posted in TNT on 7 October 2011 by Mr. Morrow. Concord native Michael Eury, executive director of Historic Cabarrus Association and author of the recent book Images of America: Concord, is cover-featured in the Sept.–Oct. 2011 issue of Hearing Loss Magazine. The bimonthly publication is produced for members of the Hearing Loss Association of America, the nation’s foremost membership and advocacy organization for people with hearing loss. People with hearing loss often face numerous challenges with personal and professional relationships. Eury’s message to them is to never give up, no matter how insurmountable the odds, and to seek guidance and resources to help them communicate and participate in life. 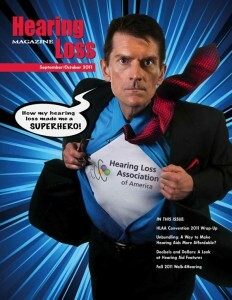 His article can be read online on Hearing Loss Magazine designer Cindy Dyer’s blog, at http://cindydyer.wordpress.com/2011/09/06/michael-eury-superhero/. An estimated 36 million (17 percent of) Americans suffer from hearing loss. To learn more about the condition and how to deal with it, visit the Hearing Loss Association of America’s website at www.hearingloss.org. This entry was posted in TNT on 5 October 2011 by Mr. Morrow. Why the long delay between issue #15 and #16 of BrickJournal, our mondo mag for LEGO fans? Well, editor Joe Meno’s not to blame, as he had #16 completed right on time, so it’d ship last July. Unfortunately, our good friends at LEGO went through some major personnel changes in their ordering department, resulting is a really long lag time before they could finally place their order for issue #16 (and without their order, we didn’t know how many copies to print). I’m delighted to annouce that we just got their order on #16, and it’s off to the printer, and will be shipping November 16. 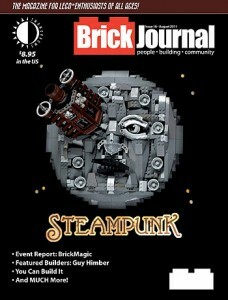 A free preview (it’s an awesome LEGO STEAMPUNK theme; wait’ll you see the Rocketeer minifigure!) is available HERE. And you can order the issue HERE., either as a single issue, or as a “Brick O’Journals” bundle of 25 copies of the new issue (great for LEGO clubs, school groups, or trick-or-treat giveaways). Plus: A big THANK YOU THANK YOU THANK YOU to our buddy Tom (The Comics Savant) Stewart, for again this year manning our table at BrickCon in Seattle, Washington last weekend. This entry was posted in TNT on 3 October 2011 by Mr. Morrow. IT’S ON! 40% off print mags, and 10% off digital mags! Now through October 31, ALL TWOMORROWS MAGAZINES are 40% OFF for the Print Edition, and 10% OFF Digital Editions! Plus HUMOR AND ONE-SHOT MAGS! This offer is for MAGAZINES ONLY (not books), and does not include new and upcoming issues that ship after the start of the sale. Some print issues are in low stock, so go get ’em before they’re gone! This entry was posted in TNT on 1 October 2011 by Mr. Morrow.